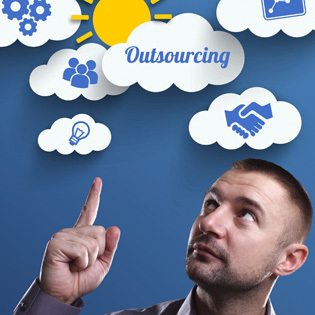 Is Outsourcing Managed Applications better for my Company? From entrepreneurs to enterprises, businesses have been embracing the concept of outsourcing managed applications as a way to improve productivity. With today’s technology-driven resources, outsourcing is often a more inexpensive way to scale up your business – or scale it down in a hurry. Is this particular business function “mission critical” – meaning you have to do it in order for it to be done properly? Or, is this function a red herring – something that is a distraction from core business processes that could be more effective if it was farmed out? Highly skilled roles, such as CPA-level position. Many times these functions require a high level of expertise but are typically in an oversight capacity. Could these functions be outsourced so that a contract CPA or bookkeeper reviews your financials monthly or quarterly to keep you on track? Repetitious tasks like data entry or shipping inventory could potentially be outsourced easily and cheaply, freeing your team up to focus on building the business. Special knowledge areas such as IT positions, including security or network administration, are very popular to outsource. Having on-site networks with hardware and the staff to maintain them is increasingly left to more enterprise-level organizations. But in 2017, even enterprise organizations are choosing to outsource to cloud-based services. 35% inquired about the cost. While we all would agree that email is one of the most critical business communication tools today, it is interesting to note the increasing popularity of managed email services in the cloud. This says a lot about outsourced managed applications as a service; clearly, even the most conservative enterprise organizations are adopting these models. Outsourcing email follows the typical cloud subscription model, which creates a manageable budgetary framework that is particularly attractive to entrepreneurs and small businesses where cash flow is still an issue. Generally, outsourcing managed applications allow for greater competition for even the smallest of businesses. With the rise of software as a service (SaaS) models, all businesses can benefit from the same tools that enterprise organizations have been using effectively for years. The biggest benefit is that a professional provider is managing the application, which means issues like security and uptime are really someone else’s problem 24-hours a day. Managed providers are infrastructure experts capable of handling security and business continuity in addition to the actual application they are providing. The vendor should offer solutions that embrace the cloud in all its forms, from dealing with AWS or other cloud vendors to offering their own private or hybrid cloud models. Look for a vendor that has a long track record in infrastructure architecture of all sizes. If you need customization, are they equipped to design it? How skilled are they at creating the strategic deployment that’s right for your business? An outsourcing managed applications partner should be your single point of contact for the service. If a problem arises, they own it completely, no matter what time of day it occurs. As you’re interviewing vendors, this is a crucial point; will the provider be a true partner that takes managing this service off your plate? Can you truly turn the service over to them and just let them proactively manage it? If your application partner is overseas, make certain you recognize the possibility of language barriers as well as time zone differences. Ultimately, most businesses agree that outsourcing today offers great advantages that include cost savings from lessening your professional staffing needs. Outsourcing is delegation at its finest, and the majority of American companies are leveraging this model. How do we know this? According to CompTIA, the global managed service market will grow to $193 billion by 2019. Signing a contract with a managed services provider is the first step in what should become an effective partnership. Your process will include working with the outsourcing managed applications provider to migrate functions and then create workflows to train and work with the new provider. Communicating effectively means establishing your expectations and understanding fully what the provider offers as part of your contract. Managing the vendor relationship is essential for the success of the service. Regular communications, transparency, and flexibility are all a necessary part of the transition process. The goal is for the business owner to have the confidence to step back and allow the outsourcing managed applications provider to take over and do the job. Get a free assessment and find out if your business is ready for outsourcing managed applications.